Mike Whitehead answers some questions about his upcoming fight against “Babalu” and talks a little about his new look, his training at Xtreme Couture, and other topics. Mike will be facing off against Renato “Babalu” Sobral on Saturday, July 19th at Affliction: Banned in Anaheim, CA. Click on the image above to watch the interview at the Xtreme Couture Video Center. It was a great weekend for Xtreme Couture fighters. Jay Hieron defended his IFL Welterweight Championship as Chris Horodecki and Alex Schoenauer made it a clean sweep for Xtreme Couture Fighters at the IFL show in New Jersey Friday. On Saturday night, Kim Couture stopped Jessica Cruz in the third round of their bout by TKO. 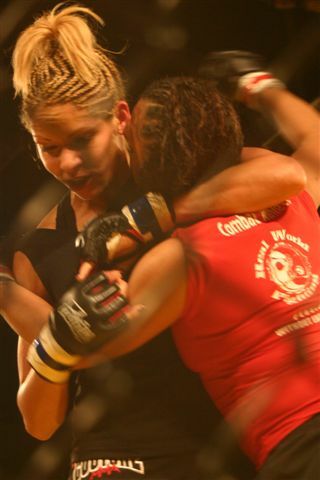 Kim’s fight marked her amateur MMA debut and took place in Portland, OR for the Full Contact Fighting Federation. Kim Couture defeated Jessica Cruz by TKO at 1:43 of the third round. The IFL is on HDNet tonight at 8:30ET/5:30PT. We have three fighters on the card. Jay Hieron defends his Welterweight Title against Mark Miller in the Main Event. While Chris Horodecki looks to start a new winning streak against Nate Lamotte and Alex Schoenauer returns to the IFL ring against Brendan Barrett. Yesterday our lawyers appeared in Judge Togliatti’s Las Vegas courtroom to address the previously continued preliminary injunction hearing. After many hours of argument, the judge agreed to fashion a remedy (without any admission or waiver or affect on any date and event other than the February 29th IFL event) based upon what Randy Couture had already advised the court he was doing and /or more than willing to do (and had already taken steps to do): (i) That he had not planned to attend the February 29th IFL event in Las Vegas; (ii) that, given the foregoing, he was not cornering at the IFL event on the 29th; and (iii) that the team name “Xtreme Couture” would not be used in the February 29th event (for the reasons discussed below). We don’t believe that anyone with full-knowledge of the facts could consider this a victory. In fact, it is a non-event. However, the background story is a little more interesting. Simply put, the IFL was attempting to use the “Xtreme Couture” name without properly representing the gym by using its own fighters. On January 8 we submitted a list of seven (7) fighters to the IFL that would be available to fight in the IFL event from the Xtreme Couture gym. The fighters were: Dennis Davis 145lbs (16-8), Jay White Heavyweight (2-5), Phil Friedman Heavyweight (1-0), Eric Uresk 155lbs (2-3), Josh Haynes 185lbs (8-8), Johnny Hendricks 170lbs (3-0), and Karina Taylor 135lbs (0-1). The IFL informed us that Dennis Davis would be booked to fight a prelim bout against Ian Loveland and that none of our other fighters would be utilized. According to the IFL none of our fighters were a proper matchup for Mario Sperry’s team of Brazilian fighters. The IFL intended to field a team of Benji Radach (who due to injury was replaced by Josh Haynes), Santino DeFranco and Lew Polley. Radach had been a member of Shawn Tompkins’ Anacondas team, while DeFranco and Polley are from American Top Team. Lew Polley and Santino DeFranco are tremendous athletes and excellent fighters. However, they are members of American Top Team not Xtreme Couture. American Top Team is a great squad and by all means seem to be deserving of having their own team in the IFL. We have 35 athletes that train in our Las Vegas gym and proudly wear the Xtreme Couture patch on their shorts during fights. Yet the IFL decided to field a team called “Xtreme Couture” without putting any Xtreme Couture athletes on the team. The Patriots didn’t show up in the Super Bowl with a bunch of players from the Packers. Why would the Xtreme Couture name be put on the line and not be represented by Xtreme Couture fighters. It is because of this that the team name was changed to “Team Tompkins”. Volume 2 of the Life & Times of Jay Hieron is coming soon. 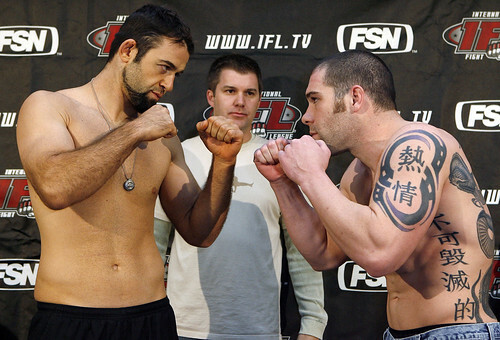 In the meantime, check out the full fight of Jay taking on Delson Heleno for the IFL Welterweight Championship. Delson Heleno is a highly regarded fighter from Brazil who trains under Renzo Gracie. Known for his slick ground skills and ability to strike from any angle, Heleno was the top ranked fighter in the IFL’s 4 man Grand Prix. Shawn Tompkins will coach the Xtreme Couture Team at the IFL Event February 29th at the Orleans Arena here in Vegas. Already confirmed for the show is Dennis Davis vs Team Quest’s Ian Loveland. Coach Tompkins submitted a list of Xtreme Couture fighters willing to step into the ring on February 29th. We’re waiting for confirmation from the IFL and will bring you the match ups as soon as they are signed.